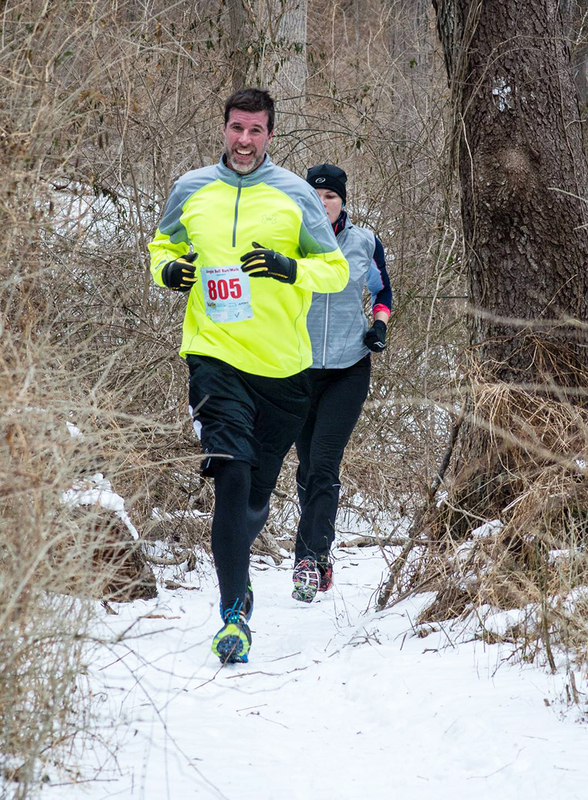 Last Saturday I ran the final 5K in the Athlete’s Closet Winter Series. After a lackluster finish at this event in February my goal was to beat my previous course-best time of 23:47 from January. I worked hard during the weeks leading up to Saturday’s race and I was fired up and ready to run FAST! Unfortunately I did not get a chance to better my official course time. Just before the race began the race director announced that the course had to be cut short due to snow and ice on a section of the road. 😞 On the bright side, he reminded us, we’d all get automatic PRs for running a 5K “minus a little bit” so at least I had that going for me! 😉 Ultimately the shortened course really wasn’t that bad but I’ll admit, I was sad to miss my chance at an official course PR after a month of hyping myself up! According to Garmin I slowed down a ridiculous amount on the final uphill stretch (I think that’s a technological glitch… I have no recollection of that!) but I still managed to squeak through the finish in 21:48. 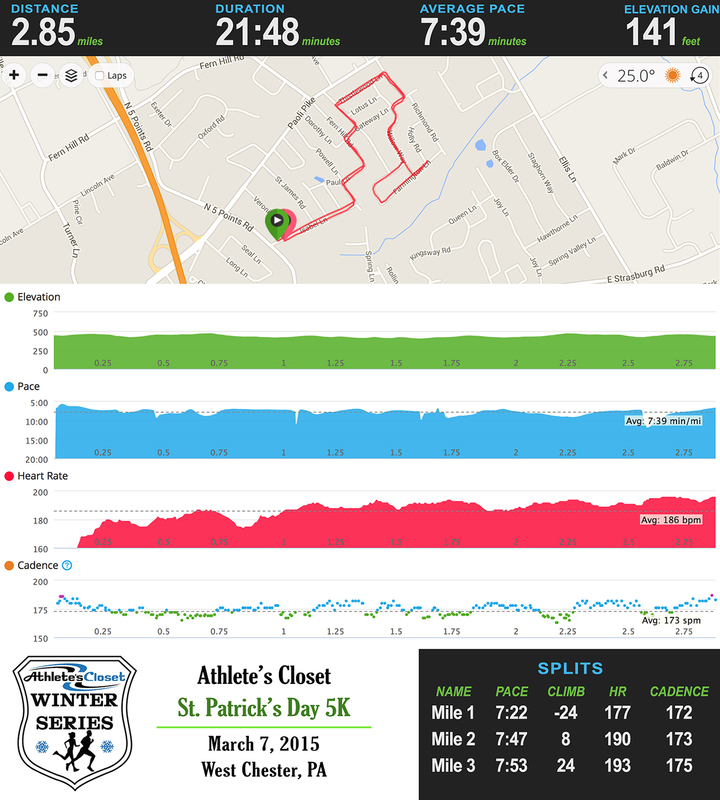 The race distance was 2.85 miles and my average pace was 7:39. Was that good enough to beat January’s pace…..?? It turns out that YES, it was!! 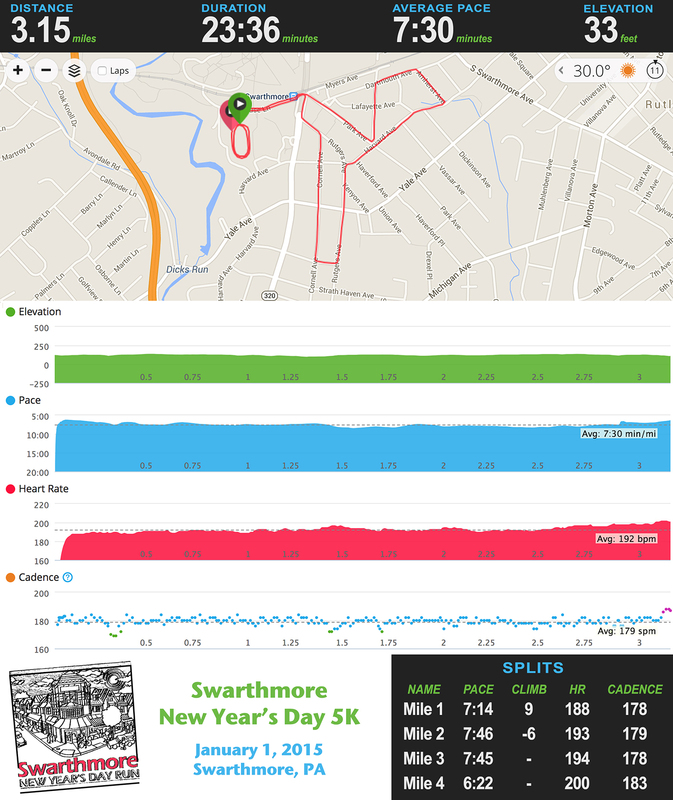 If the course had been the full length and IF (big if) I had kept up the same pace, I was on track to run a 23:42 5K… 5 seconds faster than my January time on this course! Woohoo! Seconds before crossing the finish line. I think I’m preparing my fingers to turn off my watch. Photo credit: Athlete’s Closet. 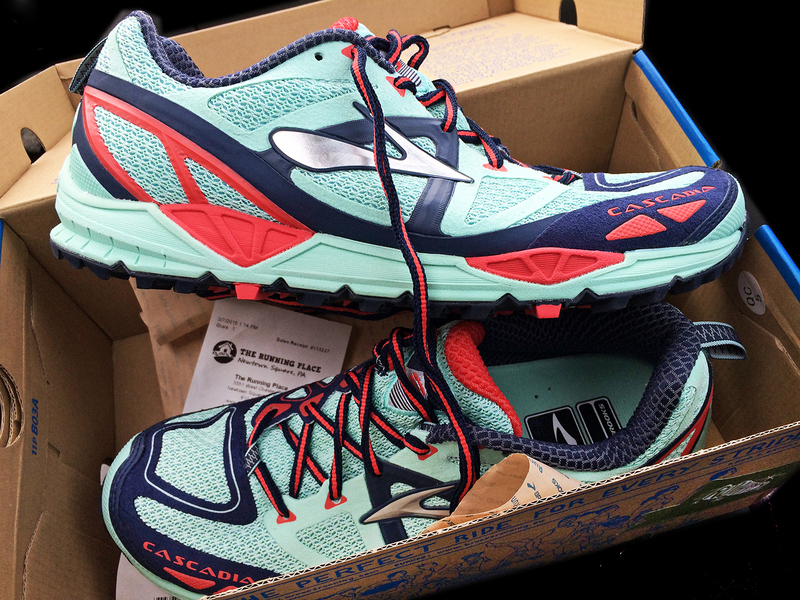 Brooks Cascadia 9s. They’re last year’s model which means that they were on sale! I took them for a spin on Sunday at Ridley Creek State Park and they were nice and comfy despite the treacherously slippery slush and snow. 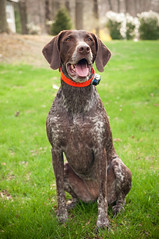 My GSP trail-trotting buddy approves! 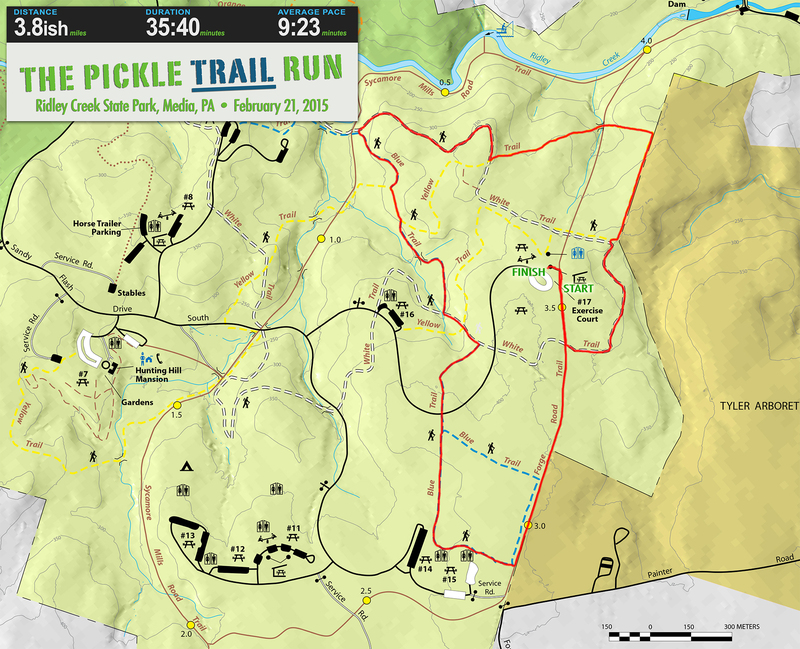 The Pickle Run #2: Trail Edition! 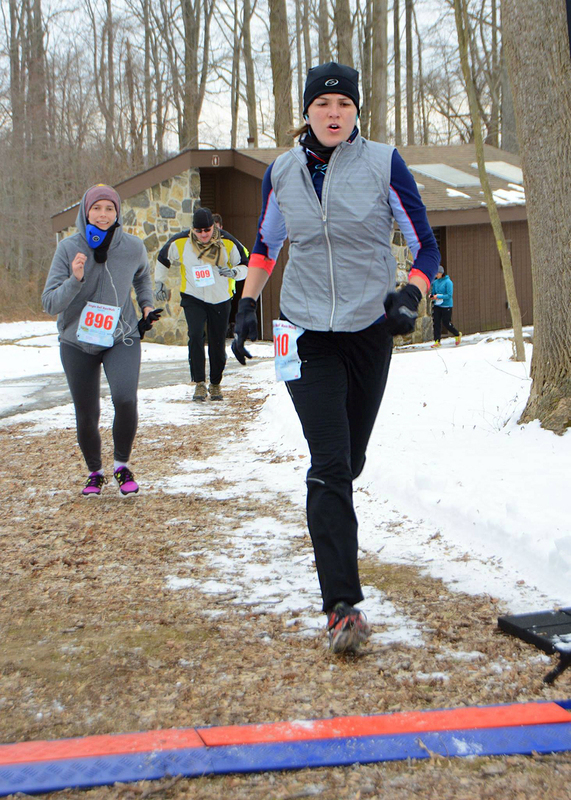 Last Saturday I ran the February Pickle Run at Ridley Creek State Park. 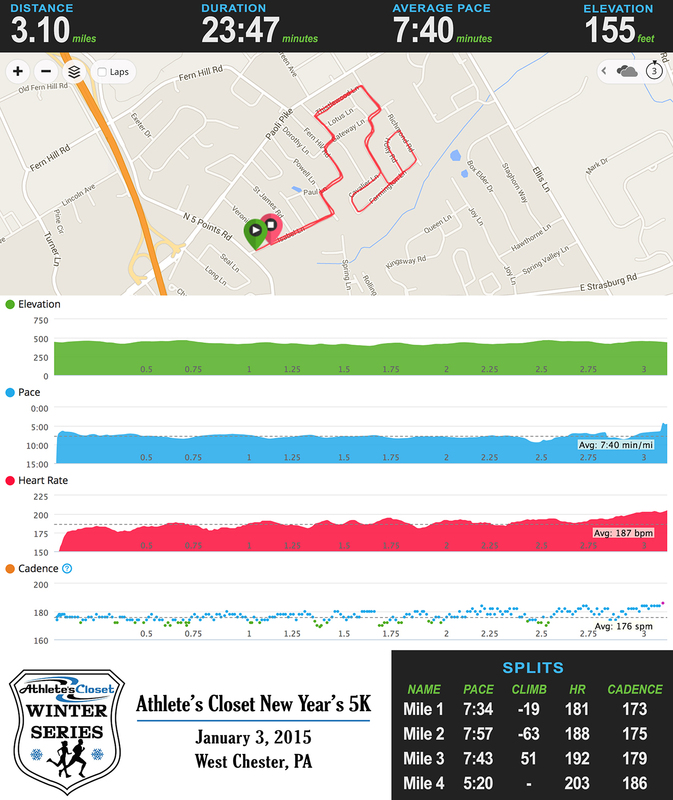 After running the all-road course at the January Pickle, I decided to give the trails a try in February and I am happy that I did! 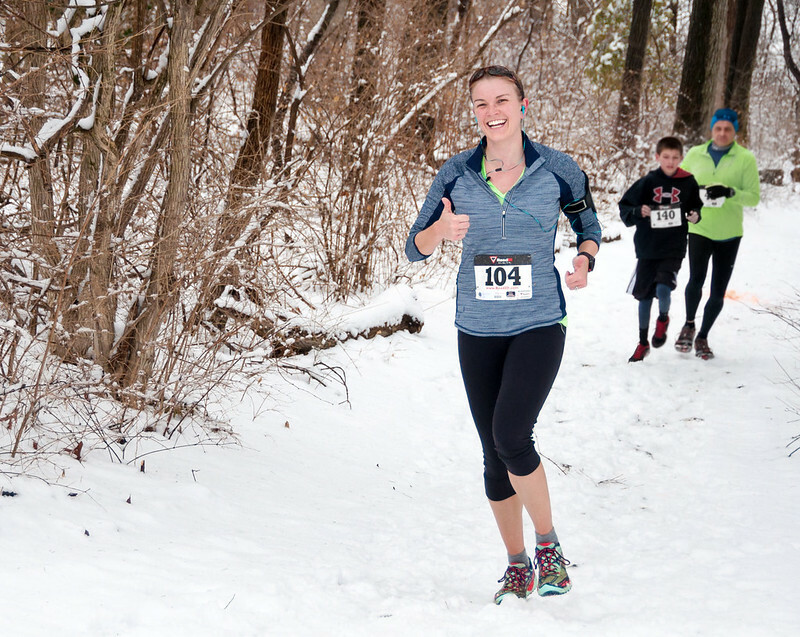 The race traversed “3.8ish” miles of hilly, winding, snow-covered trails. The trail course started out with the road-runners for the first half mile or so before veering into the woods where the first 10-15 minutes of trails flew by in a blur. I was sandwiched between two guys and the three of us zoomed through the forest making great time with no other runners in sight. Of course all of that fun downhill couldn’t last forever… with about 1.5 miles to go we turned onto the “white” trail and immediately started climbing. And climbing. I technically never walked, but I’m pretty sure that I was shuffling along at 15++ minute mile pace. Finally the trail leveled out and I realized how completely dead my legs felt with another mile still to go. Trail running is HARD! The race finally returned to pavement with less than 1/4 mile to go (or something like that… this was a prediction run so no watches allowed!) and the tired trail runners rejoined the 5K road runners who were also in the homestretch. 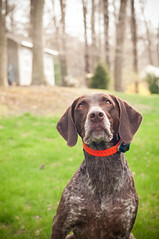 I was thrilled to be back on pavement and I picked up my pace and sprinted into the finish. 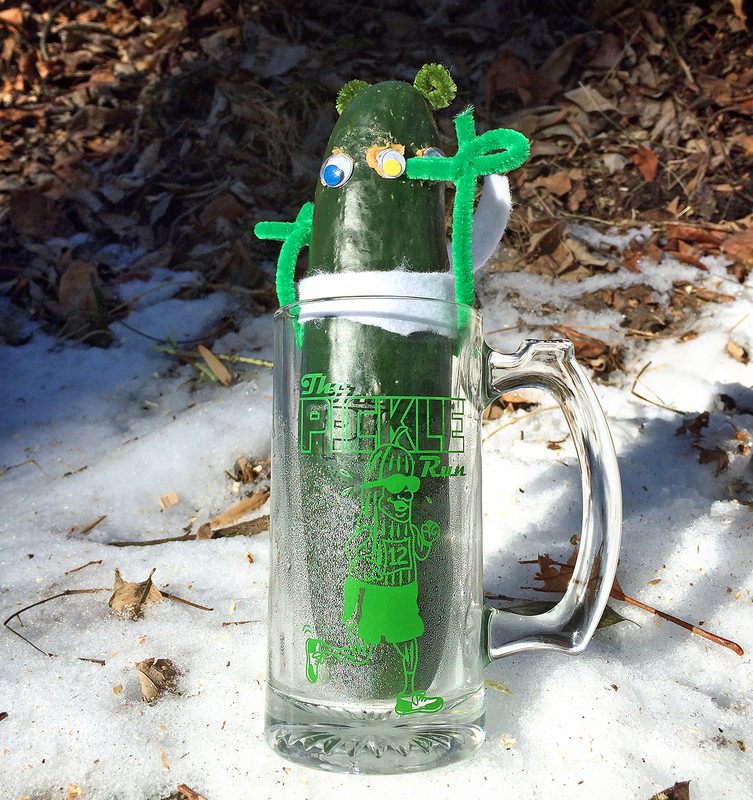 Trail pickle complete! My finish time of 35:40 means that I ran at an average pace of 9:23 per mile. Slower than road race pace, for sure, but also much faster than my mid-week trail runs so I’m happy with that! Before the race began I haphazardly guessed that I’d finish in 36:00 not really knowing what the conditions would be like. Wildly, this meant that my prediction was only 20 seconds off which was good enough for 3rd place and another pickle-in-a-beer stein award. Awesome! 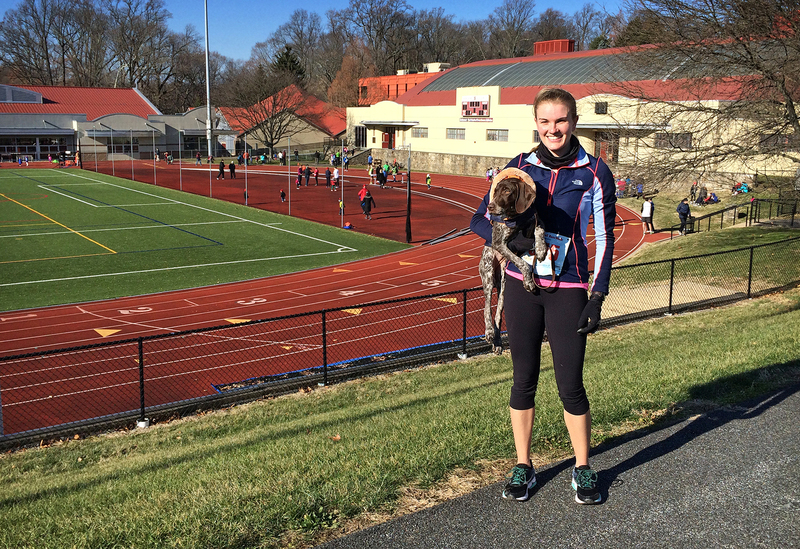 My next race is March 7th… the last of the Athlete’s Closet Winter Series. I have been sticking with my speed work and tempo runs and I am looking forward to running FAST on the nice, even pavement!! 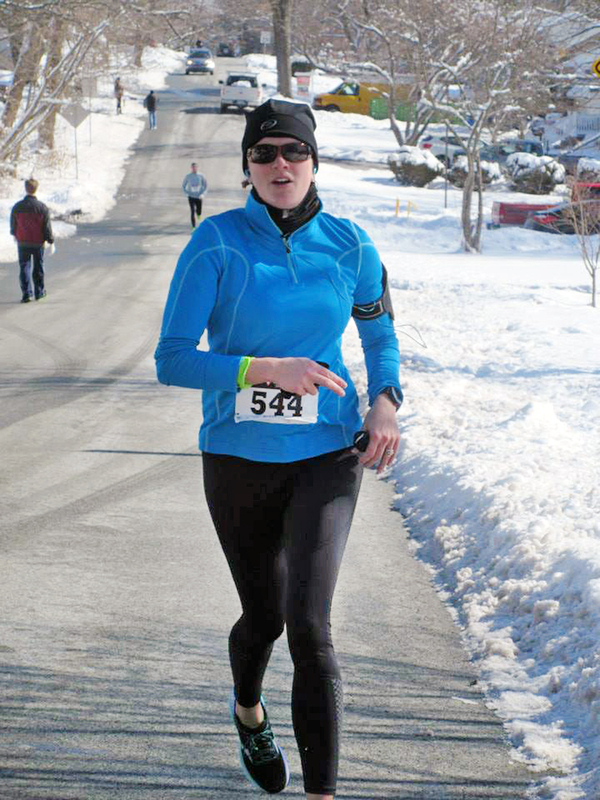 Last Saturday I ran the third of four 5Ks in the Athlete’s Closet Winter Series. Coming off of a month of slower trail runs, time in Vegas and really no speedwork to speak of, it was not surprising that I finished Saturday’s 5K much slower than my January 5K time from the exact same course. I started out a little too quickly (ok, a LOT too quickly!) and then faded pretty significantly towards the end of the race. 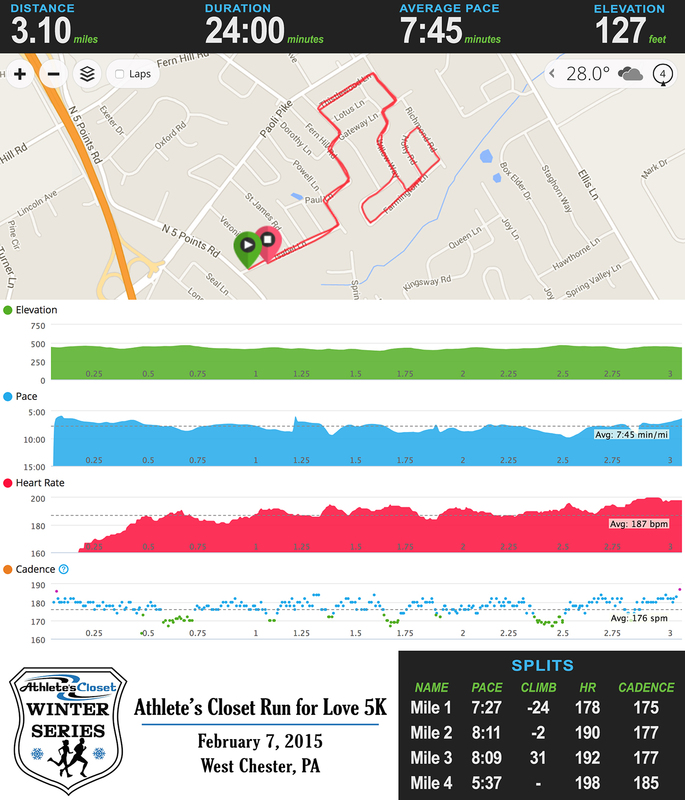 I felt OK the entire time (well, until I looked at my watch after mile 2 and saw 8:11!) but I just couldn’t make my legs go any faster. 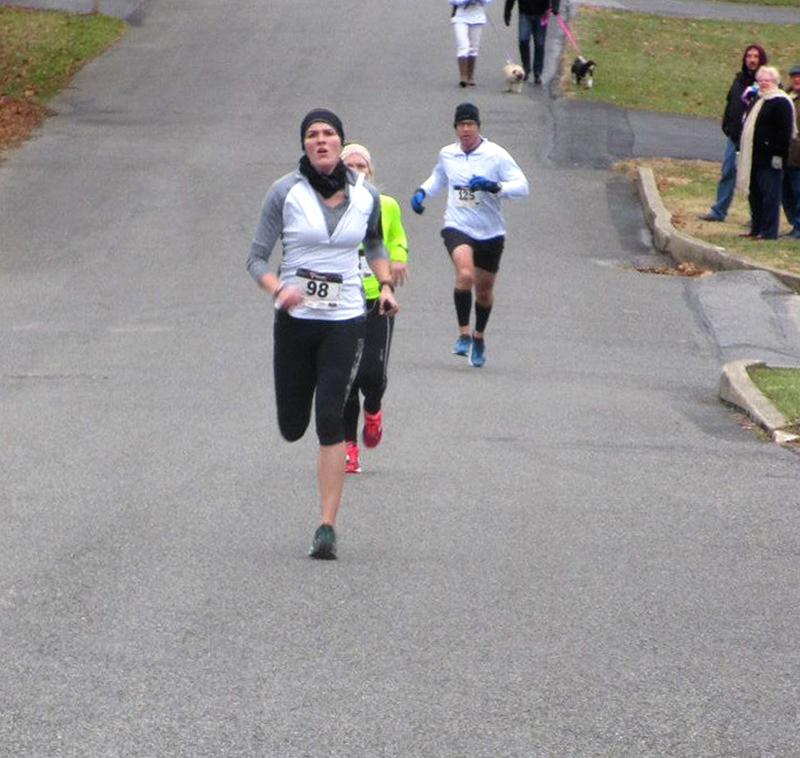 My finish time of 24:00 was 13 seconds slower than January’s AC 5K but, surprisingly, was still good enough for 3rd woman overall and top in my age group. 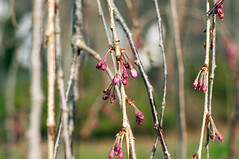 I guess we’re all getting a little slower as winter drags on! 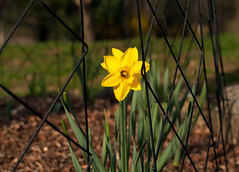 Despite my lackluster performance I left the race with renewed determination. 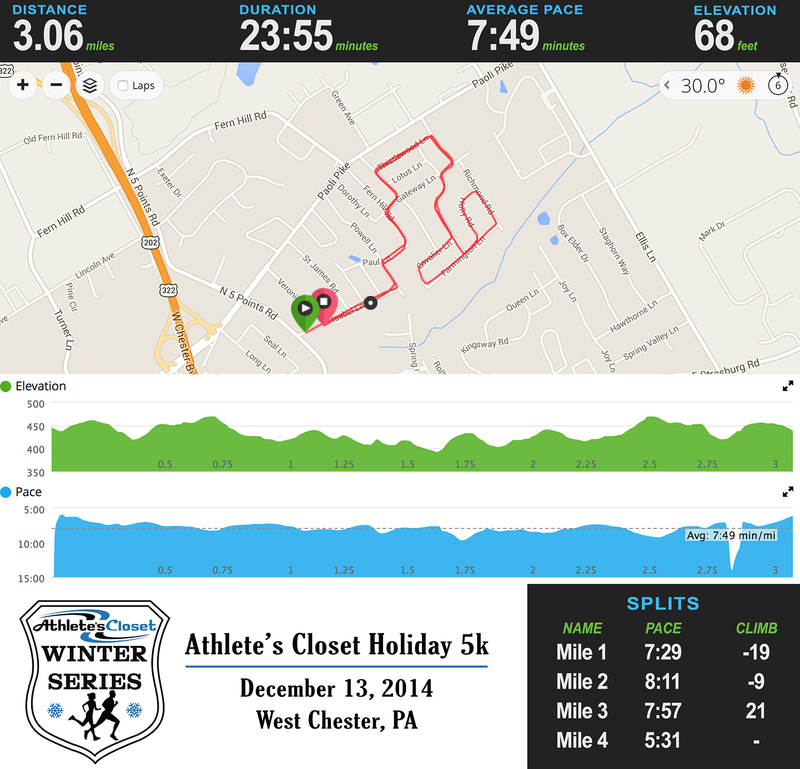 I want to beat my course best time of 23:47 during March’s Athlete’s Closet 5K and I know I can do it! 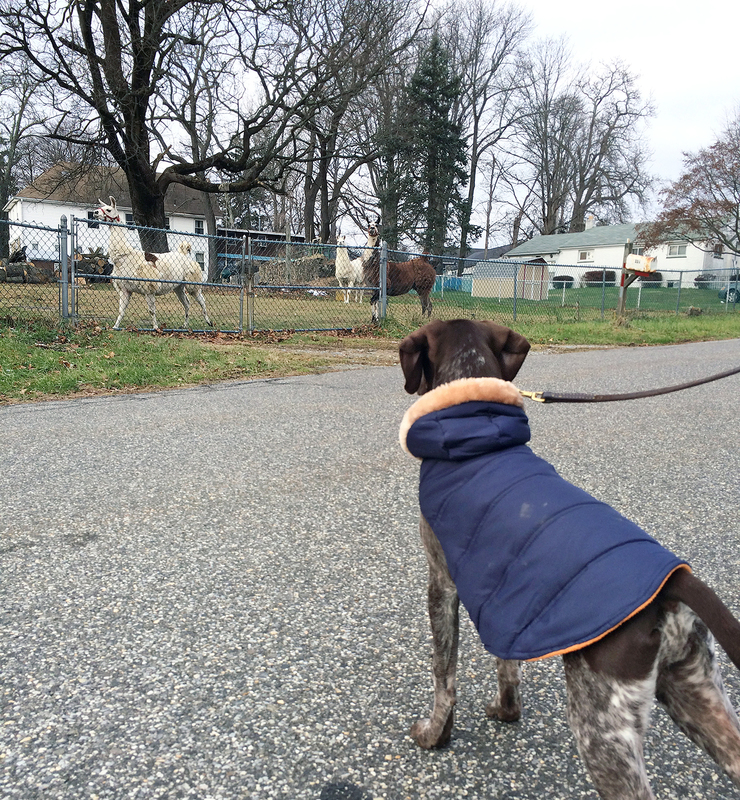 I drove home feeling excited by the prospect of resuming speedwork (crazy, right??!) and found myself looking forward to picking up the pace on training runs. 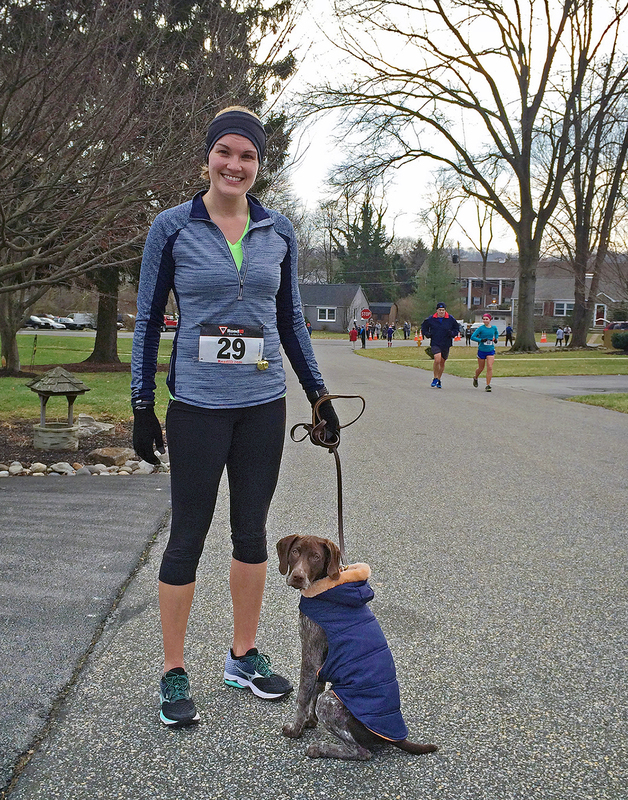 The final Athlete’s Closet 5K in on March 7th and I am going to be ready for it!! I have four weeks to work on my speed. I kicked things off Monday with 5 miles on the treadmill while watching Seven Years in Tibet. * Then things really got going on Tuesday with my first speed workout since before Thanksgiving: 6 x 800m intervals on the treadmill with 400m jog recovery in between. 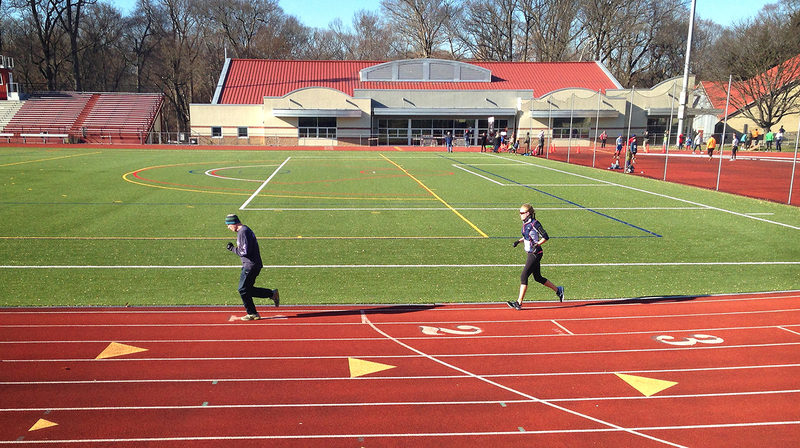 3:42, 3:41, 3:37, 3:35, 3:32, 3:25… I CRUSHED this workout with a better average pace than I ever ran on the track last Fall. 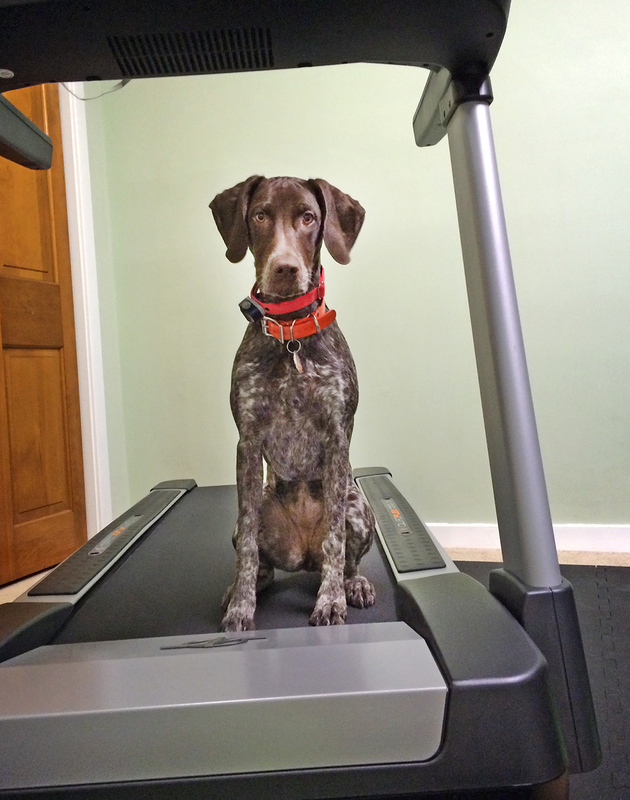 After a nice cool down I climbed off the treadmill more determined than ever. *Side note: I last saw Seven Years in Tibet when I was 13. It was SO much better to watch now! Fascinating 1940s history plus young Brad Pitt.